As I am reading Within the Frame by David duChemin this month, I am starting to think about and work on my vision. During my photowalk around the Village of Liverpool earlier this week I took a little extra time when looking through the viewfinder. Asking questions beyond the technical (focus, aperture, shutter speed) to see if what I was photographing is what I wanted to communicate. Let’s see how I did. What does this photo tell you? I added and subtracted elements in this photo by moving and using the Nikon 18-200mm VR to zoom in and out until I was satisfied I told the story as I saw it. I could tell you what that story is. However, I am more interested in what you think the story is. What does this photo tell you? This next photo I didn’t happen upon as I did the one above. I’ve seen this structure my entire life. I wanted to tell you something about it. Everything you see I had thought about before I set up my tripod and waited for the Sun to drop below the horizon. What does this photo tell you? How about this one? What does it say to you? There is no right or wrong answers just your thoughts. Thank you for your time! This entry was posted in Photography and tagged david duchemin, flowers, liverpool, long exposure, new york, night photography, restaurant, shop, story, storytelling, tripod, tulips, vision. Bookmark the permalink. Hi Scott. Let me try to dissect your images – which at first impression are appealingly colorful. 1) Objective:A photo taken kneeling down in front of an exhibition of flowers – mainly tulips. The reason for kneeling down was to include the sign with the name, and a view of the clear blue sky. What do you want to tell me? : It is about time to buy some flowers for the wife / garden. You can buy them at D.G.Lawns! 2) O.:A photo of a restaurant placed between the main-road and the railway. Why do you want to show this restaurant to us? : You have probably been here many times. You like the color contrast of the sign and the blue tower over the main door. The outside tables for dining must be in quite a noisy place. There are not many people compared to the size of the restaurant. I’m looking forward to reading your story. 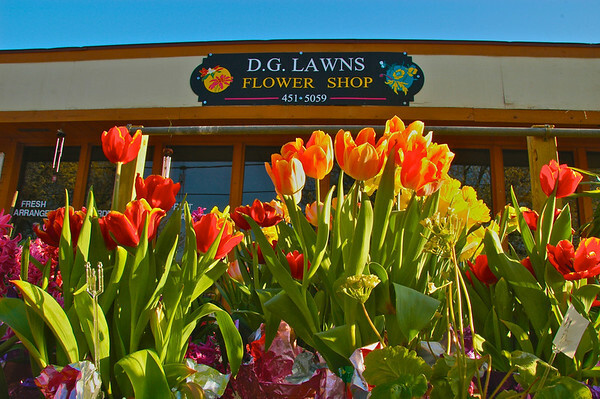 Photo #1: DG Lawns is clearing out the rest of their supply of potted bulb flowers. Some of the tulips look just a wee bit past their prime as they are fully open; fresh tulips are usually more closed. You emphasize this “passing of their prime” with the late afternoon light illuminating the shot from the right side, and including in small words, to the left of the shot, “fresh arrangements”, which are likely available inside. Reminds me of the ‘good ole’ days’ memories of places well remembered at certain seasons and times in life… that is what both photos tell me. If I went back to my childhood hometown, and I’m thinking of the 2nd childhood hometown where my Grandma lived, I know I would take photos of the places that held memories of the ‘good ole’ days’ if they were still standing. Now isn’t that funny how I’m way different in response than the two replies above. In the eye (and perhaps experience and memories) of the beholder and the photographer in what a photo portrays as a story? 1. It’s a new morning, with perhaps the early morning sun shining on the tulips that signify renewed hope and spring. 2. It’s early evening, maybe even in the same day, that evening light and the glow of people enjoying their last bits of time together. Morning and evening of a good day, measured gently in your photographs. Oooh, I love HEID’s. It really doesn’t “tell” me much, Scott, but it does bring back memories of the old A & W drive-in that was blocks from where I lived as a kid. My folks would take me there for burgers, which would sit on a tray that hung precariously from the car window. Nice shot. I have a few places like this (stuff I want to get around to photographing), to the point where I keep a list of future day shots and night shots. First of all, I love the bright colors in each photograph. Photo #1 suggests to me a sale of Easter tulips, verified by the plastic card supports still poking out of the soil. I imagine that they are displayed on a table in front of the store to attract customers and for a quick sale of the store’s remaining tulips and other spring flowers–I think I also see gardenias,daffodils, and hyacinths.The angle on this photo is great. It brings the tulips and store front together perfectly. This is a time-lapse photo as indicated by the car headlight streaks on the road and the deep blue sky of evening. It appears to me that the diner is home to a few faithful customers whose cars remain while so many others pass on by. The outdoor seating area is empty, indicating perhaps that Heid’s may no longer serve the “Food You’ll Like” as it might have done in the 50’s when it appears the restaurant was built.It’s a nostalgic scene that draws me back to some of the local establishments where I used to enjoy a root beer float and a burger. Thank you Carsten, Karma, Anna, Dawn, Dave and MJ for your analysis. What an eyeopener for me which is a good lesson for all of us which I will explain in a minute. Photo #1 is indeed a photo of a display of tulips and other flowers in front of a flower and lawn store. Karma, good eye on the fresh arrangement sign. I did include that on purpose as a side note to my main theme of Spring flowers for the Home. Dawn, as you have no idea when this photo was taken, I enjoyed your morning/evening comparison. It is an evening photo with sunset about an hour away but thre is no way to know I was facing south when I took this. Photo #2 is the one with a lesson for all of us. I took this on a Tuesday evening which was cool. Being mid-week, Heid’s was not very busy. Most of you got the impression Heid’s is a bit past it’s prime and might even be on the downside of it’s run. If I had taken this photo at lunch time on a warm day, the parking lot would have been full with a line of people out the door. Carsten, the outside seating is noisy as the intersection Heid’s sits on is extremely busy but that’s part of the charm of eating there. Some of you mentioned how retro it looks. In the 70’s Heid’s was considered out of date and then the TV show Happy Days made the 50’s neon motif popular again. 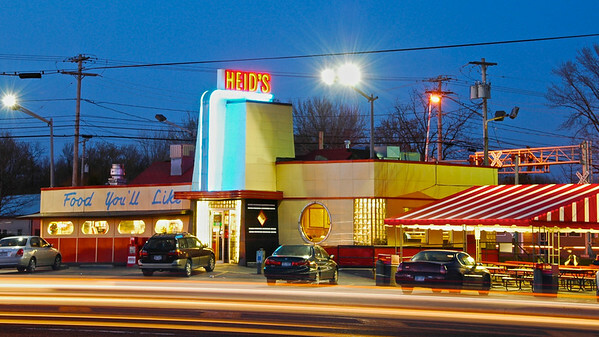 Since then, Heid’s has marketed itself as a classic in both look and food. Heid’s has a simple menu of hot dogs and coneys on fresh rolls which are supplied by local companies and use propriety recipes. Oh, my take…to show a unique place to eat “Food You’ll Like”. My choice of waiting for dusk was to emphasize the retro neon. What glorious colors! The first one says it’s time to be happy. It’s spring, enjoy the days! The second one makes me really curious about who’s in there. It’s inviting, I imagine it to be fun place.. I love the tulips vibrant colors, made me think of planting season. I bet Heid have good hamburger, one of my favorite American foods. I haven’t read the other comments, but here is the story the two photos tell me: the tulips are reaching up to the sign. The energy of the flowers moves upward (illuminated with light). It tells me: buy some flowers for Mother’s Day. The second photo tells a story of back in the 1950’s or 1960’s. It brings us back to another era when life was–seemingly–simpler. The night shot makes it more nostalgic; takes us on a longer journey backwards. I am bit late commenting your two pictures, Scott but when I first saw them I smiled at the first one 🙂 how inviting the tulips were to visit the shop, almost reaching out to the photograph and telling :”come in, there’s more to see inside” ! Gorgeous colours ! Both are interesting shots because there is so much to see and relate to. I should do more of this. thank you.